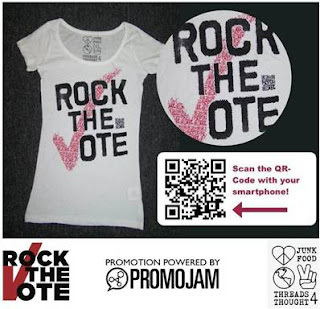 Junk Food, Rock the Vote, and Threads for Thought announced a new partnership today to get the word out at some of the most popular music and entertainment festivals in the US. That word? Vote. 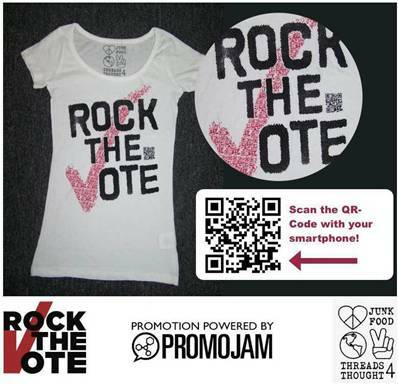 Using a relatively new and increasingly popular 'QR code' system, anyone who wears one of the 'Rock the Vote' Tees basically becomes an interactive billboard. All someone needs to do to read the code printed on each shirt is scan said code with their smartphone (with the correct App of course). You'll then be taken (on your phone, not in real life) to a PromoJam site loaded with educational videos and activities. You'll be able to do stuff like 'Like-ing' RtV on FaceBook right from the site. The Tees will be first unveiled at the Warby Parker Citizen's Circus music festival(during SXSW). That's at the French Legation in Austin, Texas, by the way.